You can take the pen out of the knife...and then put the knife in a pen! I lost my Swiss Army Knife a few months ago; my third iteration of the venerable Victorinox Super Tinker model. Though my girlfriend replaced it with a Gerber multitool, I still pine for the red plastic and shield and cross of the Swiss Army (hey, they're neutral—what do they really need an army for?). But how do you choose what tools make it into your pocket knife? Well, if you're knife maker Wenger, you choose all of them . Meet the Wenger Giant Knife 1.0. 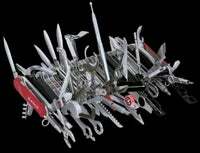 It features 85 tools; everything included in any model of a Swiss Army knife, from a standard 2.5" blade to a laser pointer with 300 foot range. For when you really need to entertain your cat. Granted, all of this comes at a price to compactness; the Wenger Giant Knife weighs in at 2 lbs. and measures 8.75". But it has a key ring. So you're all set. It'll also run you $1200, should you be so inclined...and crazy .